The cyclobutane ring is a unique structural element found in a wide variety of biologically active natural products and synthetic molecules. Although cyclobutanes have been known for centuries, as a result of inherent ring strain, their application in synthesis has only become more popular in the last 40-50 years. 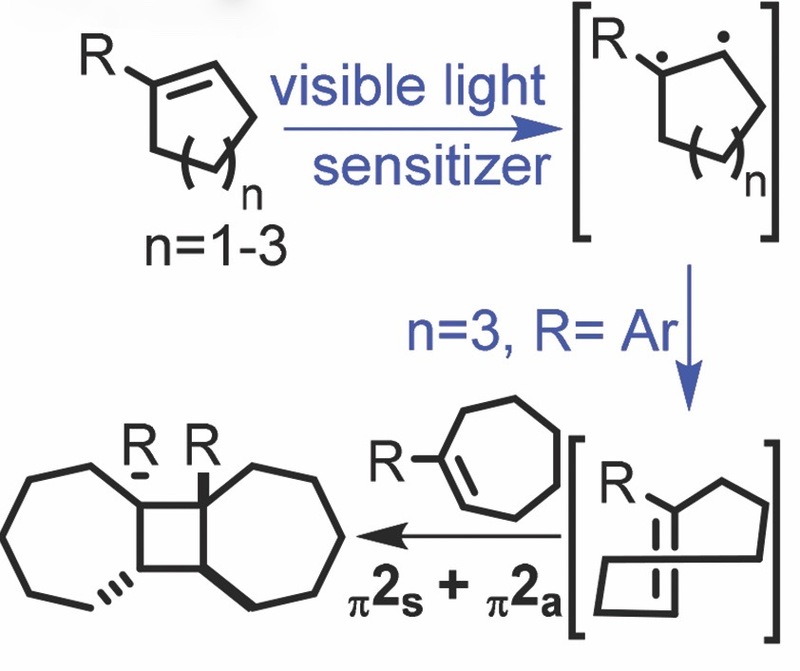 The photochemical [2+2] cycloaddition of alkenes represents a powerful strategy for the synthesis of cyclobutane rings. 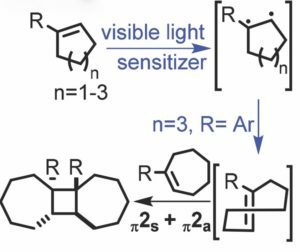 However, direct irradiation of cycloalkenes with UV light often leads to unwanted and difficult to control rearrangement pathways. Professor Jimmie Weaver of Oklahoma State University proposes an alternative to direct irradiation of cycloalkenes by instead capturing energy in the form of ring strain. The Weaver group has applied their mild and efficient methodology toward the synthesis of cyclobutane rings imbedded within a C2-symmetric tricyclic framework. It is well known that thermal [2+2] cycloadditions are ‘forbidden’ processes due to unfavourable orbital overlap of the reaction partners during the transition state. However, a common exception to this is the [π2s+π2a] addition of alkenes and ketenes. The Weaver group proposes that a thermal [π2s+π2a] cycloaddition could take place for ground state alkenes by generating a high energy intermediate, which would result in a decreased relative energy barrier for the thermal cycloaddition. This method uses an iridium-based photocatalyst to generate the highly strained trans-cycloheptene intermediate—which possesses 27-36 kcal/mol of ring strain—in order to drive the thermal [2+2] cycloaddition of cycloheptenes and various cycloalkene substrates. Interestingly, the reaction results in four new stereocenters which are generated with excellent stereoselectivity and regioselectivity. An added advantage of using light within the visible spectrum to activate the photocatalyst minimizes competitive photochemical [2+2] addition pathways. This study is an excellent example of the application of basic principles to drive previously inaccessible mechanistic pathways. The authors hope that their study will encourage other applications of visible light energy to drive unfavourable endergonic reactions. Victoria Corless has recently completed her Ph.D. in organic chemistry with Prof. Andrei Yudin at the University of Toronto. Her research is centred on the synthesis of kinetically amphoteric building blocks which offer a versatile platform for the development of chemoselective transformations with particular emphasis on creating novel biologically active molecules. She is passionate about communicating new discoveries to enhance science literacy. Photoswitchable small molecules have become important tools for analyzing biological systems. The discovery of light-tuneable molecules has enabled the study of intricate physiological responses within cells through precise spatial and temporal control to modulate their function. 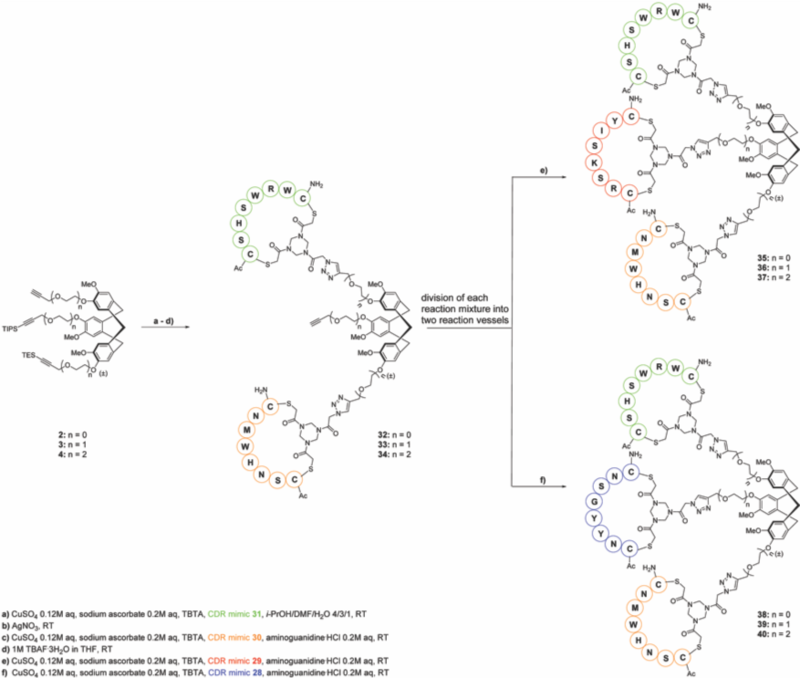 Although powerful tools, de novo design is often challenging as it requires detailed information about the structure of both the ligand and the receptor. In a recent OBC publication, the group of Professor Ratmir Derda of the University of Alberta discusses a strategy to develop libraries of light-responsive (LR) ligands, which can be produced by grafting known LR structures, such as azobenzene, onto molecules with established biological activity. 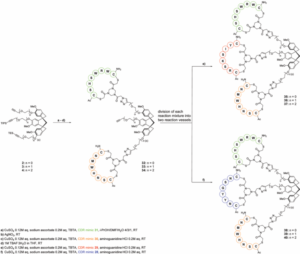 In this way, the challenges of identifying novel LR ligands can be addressed by selecting from a library of tagged LR-compounds that are already known to possess desired biological function. Their study outlines a proof-of-concept for such a library using the synthesis of LR-bicyclic peptides, which contain a hydroxyl amine and di-chlorobenzene containing azobenzene (HADCAz) linker. 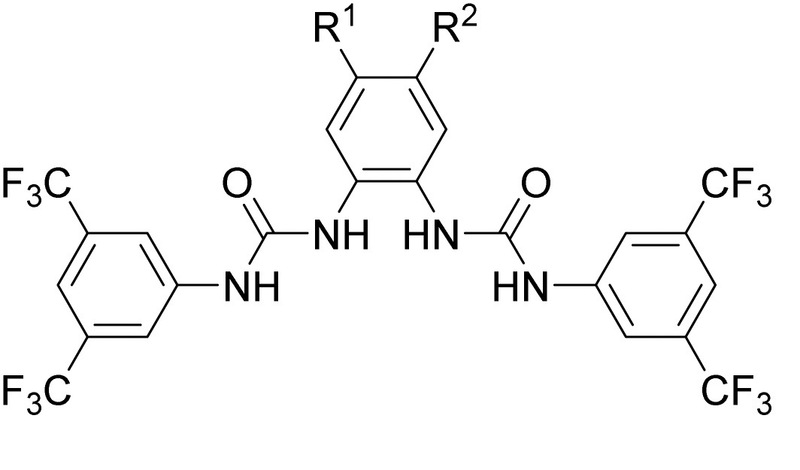 HADCAz behaves as a 3-point linchpin and can be used in the bicyclization of peptides through its orthogonally reactive ‘thiol-reactive’ and ‘aldehyde-reactive’ attachment points. 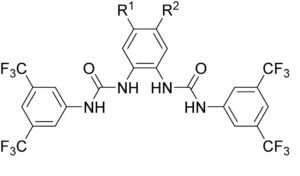 The authors successfully demonstrated the synthesis of a small library of bicyclic peptides from linear, unprotected peptides (~20 amino acids in length) in a one-pot, two step reaction involving double intramolecular nucleophilic addition and oxime formation to form the two loops. The peptide-bound HADCAz linkers were shown to reversibly switch to their cis-conformers after irradiation with 365 nm light and molecular dynamic (MD) simulation was used to assess conformational changes, the properties of which were seemingly dependent on the peptide’s length. While optimizations are still required for broad application, this work provides a versatile platform from which numerous avenues within the realms of optochemical genetics and photo-pharmacology can be explored. Victoria Corless is currently completing her Ph.D. in organic chemistry with Prof. Andrei Yudin at the University of Toronto. Her research is centred on the synthesis of kinetically amphoteric building blocks which offer a versatile platform for the development of chemoselective transformations with particular emphasis on creating novel biologically active molecules. To date, more than 320 new alkaloids have been isolated from the evergreen plants of the Daphniphyllum genus. In ancient times, extracts of the bark and leaves of Daphniphyllum plants were used in Chinese herbal medicines to cure minor ailments and treat pain. Recent studies have discerned that the Daphniphyllum class of alkaloid displays significant and varying biological activity, including anticancer, antioxidant and vasorelaxant activities. However, their unique polycyclic architectures containing multiple quaternary stereocenters render these alkaloids synthetically challenging. 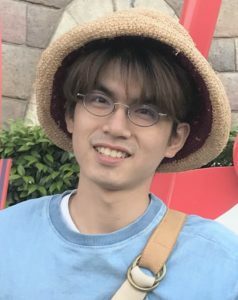 A recent OBC publication by Tohru Fukuyama and Satoshi Yokoshima of Nagoya University reports on the synthesis of a common structural core prevalent among the Daphniphyllum alkaloids. The common [7-5-5] tricyclic core features a quaternary carbon centre, two contiguous stereogenic centres and a tetrasubstituted C-C double bond. 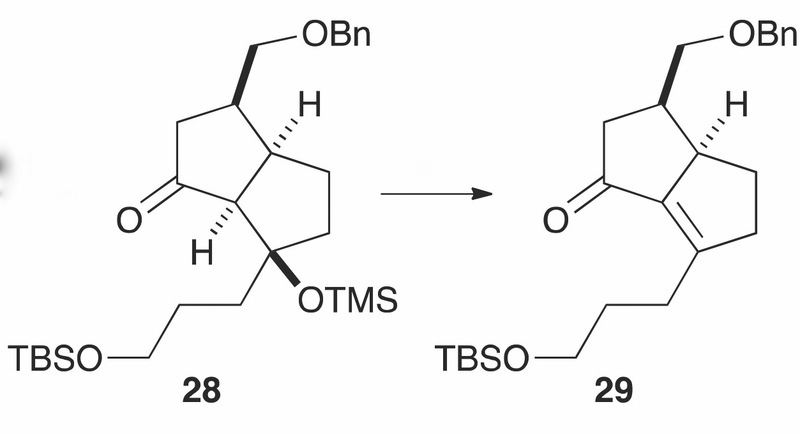 The study began with the synthesis of the adjacent stereogenic centres, which was ultimately achieved through a Claisen-Ireland rearrangement with a 73% isolated yield (1 step) and dr = 6.3:1. The challenging tetrasubstituted C-C double bond was tackled next. 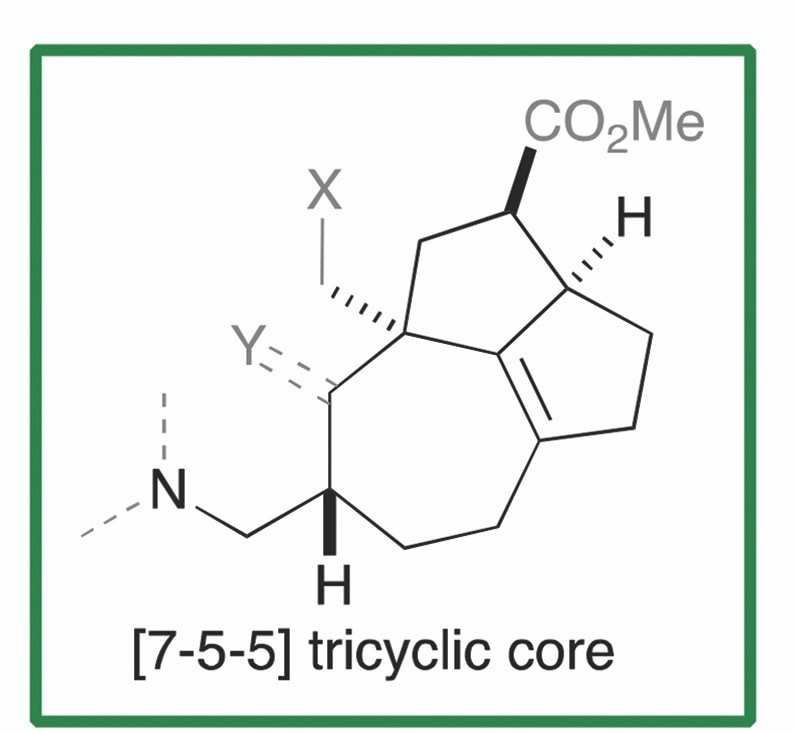 Limited procedures for the installation of the tetrasubstituted C-C alkene have been reported for the [7-5-5] tricyclic core. The highly congested nature of such substituted double bonds results in destabilizing eclipsing interactions, which are mirrored in the transition states leading to them. The tetrasubstituted C-C double bond of the [7-5-5] tricyclic core was therefore carried out using an E1cB-elimination of intermediate 28 to generate the a,b-unsaturated ketone 29 with a 78% isolated yield. Extensive investigations revealed that the quaternary carbon centre could be accessed through a 2,3-Wittig rearrangement, which occurred stereoselectively on the less hindered face of the bicyclic intermediate. Quite efficiently, this transformation yielded intermediate 36 which contained a vinyl group that was to be used in the construction of the 7-membered ring. Final steps included a ring-closing metathesis and an intramolecular carbonyl ene reaction to complete the [7-5-5] ring system. 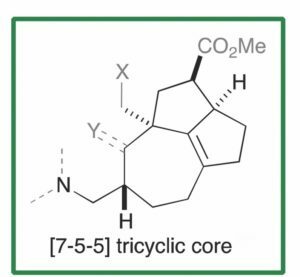 This creative study provides an excellent platform for the total synthesis of Daphniphyllum alkaloids that have the [7-5-5] tricyclic core. The 16th Symposium for Host-Guest and Supramolecular Chemistry is an annual symposium that covers all aspects of the chemical sciences related to molecular recognition and supramolecular chemistry. This year the symposium was held on 2 – 3 June 2018 at the Tokyo University of Science, Japan. The event included a special lecture by Dr Shigeki Sasaki and invited lectures by Dr Takashi Hayashi and Dr Katsuhiko Ariga. Congratulations Zhan and to all the poster prize winners at the symposium! Molecules capable of mimicking the binding and/or functional sites of proteins represent a promising avenue for the development of potential drug candidates. This strategy allows for the incorporation of key structural features into simpler scaffolds and opens a wide range of opportunities for developing molecules with enhanced and modular biological activities. A recent OBC publication by Professor Rob Liskamp of Glasgow University addresses a current challenge in the development and application of complementarity determining region (CDR) mimics, which have recently been shown to successfully behave as synthetic antibody mimics. The concept of simplifying large proteins into simpler structures requires the synthesis of preorganized molecular scaffolds, which function as the core structural unit for attaching the biologically active CDR component. Such analogues have been shown to possess increased bioavailability, proteolytic stability and exhibit reduced immunogenic responses. The group had previously reported the synthesis of a CTV-derived scaffold (Figure, compound 2), onto which different peptide segments could be incorporated, essentially generating synthetic CDRs with novel and tuneable physico-chemical properties. Poor solubulity however, has limited the progress of this class of compound in the drug discovery process. Their current study focuses on the development of a scalable, one-pot synthesis of water soluble CTV-derived scaffolds (Figure, compounds 3, 4), which incorporate mono or diethylene glycol spacers. Late-stage diversification of the CTV-derived scaffolds is ammenable through Cu(I)-catalyzed azide-alkyne cycloaddition. This allows for the generation of a diverse series of synthetic antibodies, which were shown to mimic the antigen binding site of monoclonal antibody (mAb) infliximab (Remicade)—used for the treatment of human tumour necrosis factor alpha (hTNFa) mediated autoimmune diseases. SPR binding studies against the hTNFa receptor identified 5 leads with KD’s measured between 11 and 66 mM. While further modifications are required to improve solubility for evaluation in vitro, this study demonstrates the potential of this work to extend beyond antibody mimics. As any azide handle can be linked to the CTV-derived scaffold, one can envision the application of this methodology toward alternative protein mimics. Bioorthogonal reactions offer a unique and highly effective means of studying biological molecules in their native environment. Classical examples include native chemical ligations, Staudinger ligation, and click chemistry though numerous examples have been reported in the literature over the past several decades. The majority of studies centred around the development of bioorthogonal reagents have focused on improving kinetics and selectivity in vivo. However, less explored are reagents in which their reactivity in biological settings is modulated through controlled activation by light or a specific enzyme. 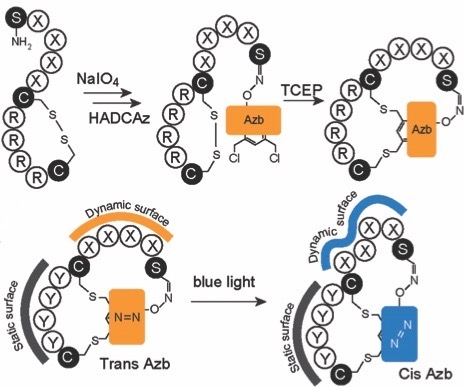 In their recent OBC publication, Professor Scott Laughlin and coworkers describe the modular control of novel cyclopropane-tetrazine ligation. Previous reports have demonstrated the poor reactivity of C3 disubstituted cyclopropene in these types of reactions due to unfavourable steric interactions between the C3 substituents and the tetrazine during the transition state (Figure A). To this end, 3-N-substituted spirocyclopropenes were designed to control ligation through a “reactivity caging strategy” in which the introduction of a removable bulky N-protecting group sterically inhibits premature reaction with the tetrazine partner (Figure B and C). The novel cyclopropene scaffold was synthesized from commercially available starting materials in good overall yields and applied successfully to the labelling of a tetrazine-modified protein. 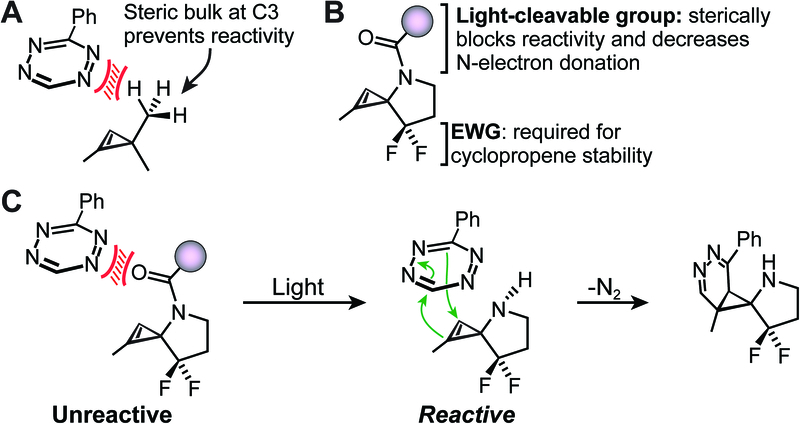 Given the widespread use of light-removable nitrogen protecting groups, the group predicts their activatable cyclopropene scaffold will be amenable to control at multiple wavelengths. While optimization of reaction kinetics is still required, this study provides interesting opportunities for the application of diverse caging groups in modulating reactivity for specific biological systems and applications. We would like to highlight the Outstanding Reviewers for Organic & Biomolecular Chemistry in 2017, as selected by the editorial team, for their significant contribution to the journal. The reviewers have been chosen based on the number, timeliness and quality of the reports completed over the last 12 months. We would like to say a big thank you to those individuals listed here as well as to all of the reviewers that have supported the journal. Each Outstanding Reviewer will receive a certificate to give recognition for their significant contribution. We would also like to thank the Organic & Biomolecular Chemistry board and the wider community for their continued support of the journal, as authors, reviewers and readers. If you would like to become a reviewer for our journal you can find more details in our author and reviewer resource centre. Organic & Biomolecular Chemistry is proud to sponsor the 24th IUPAC International Conference on Physical Organic Chemistry (ICPOC 24). The conference will be held from 1st – 6th July 2018 at the University of Algarve, Faro, Portugal. ICPOC meetings bring together chemists from academia and industry, active in the fields of organic chemistry, physical chemistry, theoretical chemistry, catalysis and supramolecular chemistry. Full list of speakers can be found online. We are proud to announce that Organic & Biomolecular Chemistry will be sponsoring Chirality 2018. The conference will take place on the 10th – 13th June 2018 at Princeton University, New Jersey, USA. Chirality 2018 will mix traditional core areas of stereochemistry with focus on emerging areas of scientific importance. The development of synthetic molecules capable of facilitating the transport of ions across cell membranes has become a prominent and active field of research. These compounds mimic the activity of natural ionophores and have found broad application in materials sciences, chemical biology and medicine. The majority of known synthetic ionophores facilitate the transport of cations. However, there is mounting evidence to support the ability of anion selective ionophores (anionophores) to act as anticancer agents and novel leads in the treatment of channelopathies—diseases, such as cystic fibrosis, caused by dysfunctional ion channels or related regulatory proteins. The ultimate hope is that they can be used to restore ion channel function in such cases. An important step toward practical application is to demonstrate the activity of anionophores not only in synthetic vesicle assays but in live cell environments. In a collaborative study between Prof. Phillip Gale of the University of Sydney, Prof. Anthony Davis and Prof. David Sheppard of the University of Bristol, the biological activity of a series of ortho-phenylene bis-urea (OPBU) anionophores was explored using a biological anion transport assay employing Fischer rat thyroid cells. This family of anionophores is readily prepared from commercially available starting materials using simple chemistry which allows for facile structural variation and the study of structure-activity relationships. It was shown that activity was dependent on both the electronic nature and lipophilicity of the bis-urea anionophore. Interestingly, while lipophilicity was shown to promote intrinsic activity it also had a contrary effect on deliverability which hampered the anionophore’s effectiveness in living cells. Bis-urea 4a (Figure) was shown to be the most effective in all assays and is based on a difluorinated central scaffold. This study provides interesting insight into the biological activity of this class of anionophores and is a promising first step toward their potential application in medicine.